Security researchers have discovered several severe zero-day vulnerabilities in the mobile bootloaders from at least four popular device manufacturers that could allow an attacker to gain persistent root access on the device. A team of nine security researchers from the University of California Santa Barbara created a special static binary tool called BootStomp that automatically detects security vulnerabilities in bootloaders. Since bootloaders are usually closed source and hard to reverse-engineer, performing analysis on them is difficult, especially because hardware dependencies hinder dynamic analysis. Therefore, the researchers created BootStomp, which "uses a novel combination of static analysis techniques and underconstrained symbolic execution to build a multi-tag taint analysis capable of identifying bootloader vulnerabilities." The tool helped the researchers discover six previously-unknown critical security bugs across bootloaders from HiSilicon (Huawei), Qualcomm, MediaTek, and NVIDIA, which could be exploited by attackers to unlock device bootloader, install custom malicious ROM and persistent rootkits. Five of the vulnerabilities have already been confirmed by their respective by the chipset vendors. Researchers also found a known bug (CVE-2014-9798) in Qualcomm's bootloaders, which was previously reported in 2014, but still present and usable. 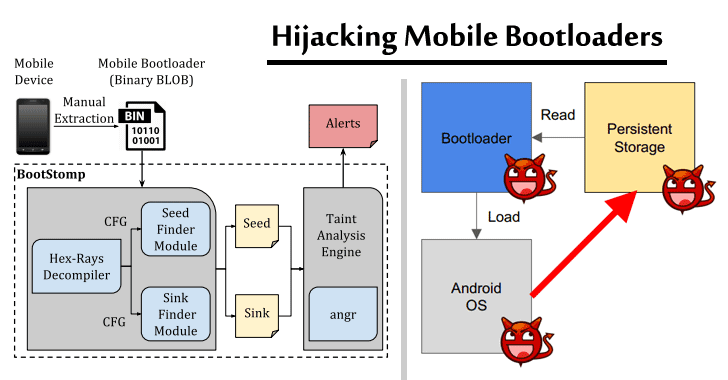 In a research paper [PDF], titled "BootStomp: On the Security of Bootloaders in Mobile Devices," presented at the USENIX conference in Vancouver, the researchers explain that some of the discovered flaws even allow an attacker with root privileges on the Android operating system to execute malicious code as part of the bootloader or to perform permanent denial-of-service attacks. According to the researchers, the vulnerabilities impact the ARM's "Trusted Boot" or Android's "Verified Boot" mechanisms that chip-set vendors have implemented to establish a Chain of Trust (CoT), which verifies the integrity of each component the system loads while booting the device. The researchers tested five different bootloader implementations in Huawei P8 ALE-L23 (Huawei / HiSilicon chipset), Nexus 9 (NVIDIA Tegra chipset), Sony Xperia XA (MediaTek chipset) and two versions of the LK-based bootloader, developed by Qualcomm. An arbitrary memory write or denial of service (DoS) issue when parsing Linux Kernel’s DeviceTree (DTB) stored in the boot partition. A heap buffer overflow issue when reading the root-writable oem_info partition. A root user’s ability to write the nve and oem_info partitions, from which configuration data and memory access permissions governing the smartphone's peripherals can be read. A memory corruption issue that could allow an attacker to install a persistent rootkit. An arbitrary memory write bug that lets an attacker run arbitrary code as the bootloader itself. Another flaw was discovered in NVIDIA's hboot, which operates at EL1, meaning that it has equivalent privilege on the hardware as the Linux kernel, which once compromised, can lead to an attacker gaining persistence. The researchers also discovered a known, already patched vulnerability (CVE-2014-9798) in old versions of Qualcomm's bootloader that could be exploited to cause a denial of service situation. The researchers reported all the vulnerabilities to the affected vendors. Huawei confirmed all the five vulnerabilities and NVIDIA is working with the researchers on a fix. The team of researchers has also proposed a series of mitigations to both limit the attack surface of the bootloader as well as enforce various desirable properties aimed at safeguarding the security and privacy of users.